Seeds can be a challenge to germinate. Pro grower level. Easy once established. Note: seeds are tiny and look like dust. 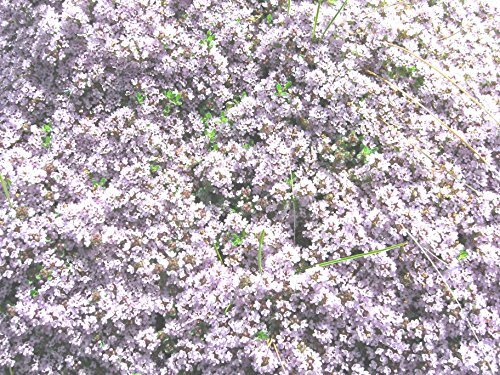 Seed Coverage: 170-180 seeds per square ft., or 2LB per acre Creeping thyme, also known commonly as 'Mother of Thyme,' is an easily grown, spreading thyme variety. It is excellent planted as a lawn substitute or among stepping stones or pavers to create a living patio. Let's learn more about creeping thyme plant care. Creeping Thyme Facts Thymus praecox is a low growing perennial hardy in USDA hardiness zones 4-9 with fairly minimal requirements. An evergreen with lightly haired foliage, this tiny-growing creeping thyme varietal - rarely over 3 inches - will appear in low, dense mats, which sprawl randomly and quickly fill in areas as a ground cover. T. serpyllum is another creeping thyme variety. Germination: Scatter the Creeping Thyme ground cover seeds and press the seeds firmly into the soil. Keep the seeds consistently moist. If you want to get a jump start on the Creeping Thymeground cover plants, sow the seed indoors 6 - 8 weeks before the last frost. Transplant the young seedling into the garden 6 - 12 inches apart. Plant creeping thyme about 12" apart to allow for its spreading habitat. If you have any questions about this product by Zellajake Farm and Garden, contact us by completing and submitting the form below. If you are looking for a specif part number, please include it with your message.